This Accu-Tab chlorinator is custom-engineered for use in red meat and poultry processing. View all food safety options. Food safety is of paramount concern in the meat processing industry. Recent outbreaks of foodborne illnesses have prompted stricter USDA regulations and more effective testing for bacteria including E. coli, Salmonella and Listeria, creating greater operational concerns for the food industry. For more than 20 years, Accu-Tab® tablet chlorination systems have serviced some of biggest names in the red meat and poultry processing industry across North and Central America. With our strategic partner, SES (Southeastern Systems, Inc.) Food Safety Specialists, we install highly engineered and customized solutions at red meat and poultry processing plants. The strength of these custom engineered systems is the state-of-the-art chemical automation that precisely controls chlorine levels and chlorinates wash water at multiple points to help kill harmful bacteria and other organic contaminents during food processing. 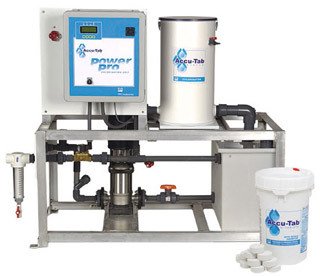 An effective and consistent alternative to liquid bleach, chlorine dioxide or peroxyacetic acid systems, the Accu-Tab system combines uniquely designed chlorinators with slow release 68% available chlorine three-inch calcium hypochlorite tablets to deliver consistent and controllable chlorine residuals. In addition, the self-buffering calcium in cal-hypo tablets is less corrosive on equipment. 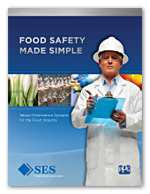 Contact an SES Food Safety Specialist to get specific info for your project. Or, download a capabilities brochure (PDF) on our Food Safety Expertise. See the Accu-Tab tablet chlorination system in action. Learn what the Accu-Tab system has over other water treatment systems. See how easily an Accu-Tab system installs into any meat Processing environment.